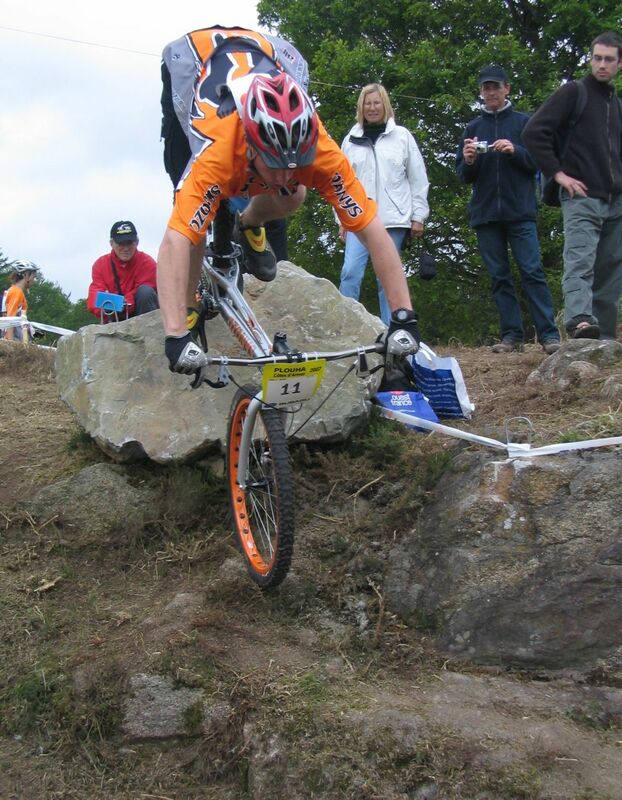 On pretty much any bike, it is possible to ride down very steep trails or even fairly big steps at a slow controlled pace, with no jump involved. This technique is fun to try out on steep obstacles or down vertical steps that are not too high. Check first that your chainring won't rub the edge. Bruno Arnold rides down as the easiest option. Vincent Hermance finds a simple line. The steeper the obstacle is, the slower you should go. Feather both brakes just to let the wheels roll without skidding. Keep your arms fully stretched to roll the front wheel down while maintaining your bum as far as possible over the rear wheel. By concentrating all your weight over the rear wheel, you'll make the front wheel lighter to control over irregularities, but it will also be more likely to lose grip upon sharp turns. Cautiously riding down big steps. Nicolas Agyemang dares a straight line. 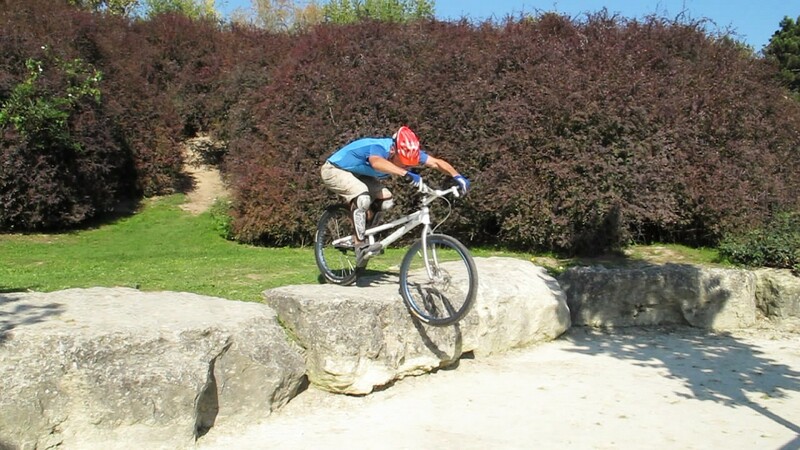 Ride to the edge of the obstacle until you get your front wheel right over the border. Feathering both brake levers, crouch back and stretch your arms to roll the front wheel down the edge. Apply just enough pressure on the brakes to control the slow motion, keep your bum well over the rear tyre. 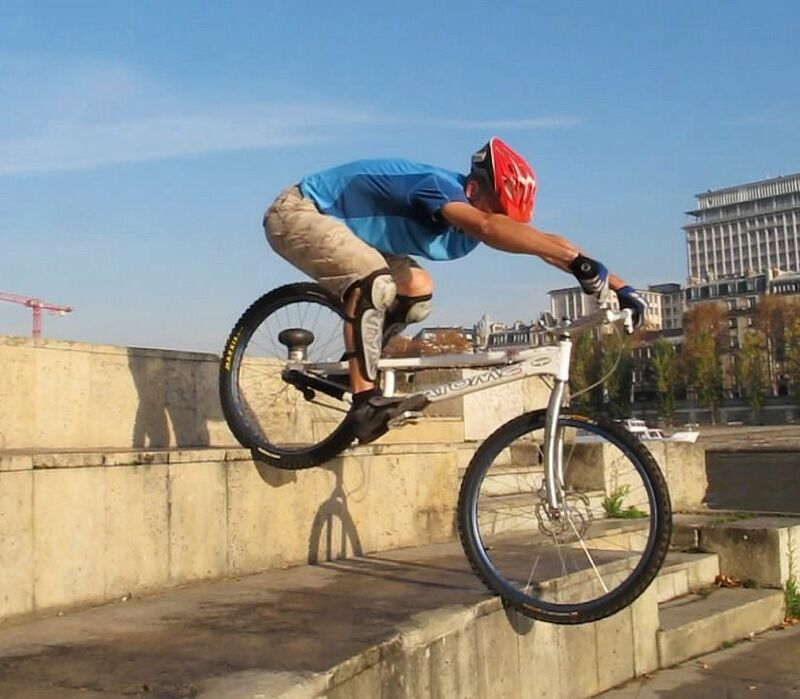 Stretch further, pushing the handlebars to the maximum until the front wheel touches the ground. Once the front tyre is rolling on the ground, control the rear wheel descent relying more on the front brake. 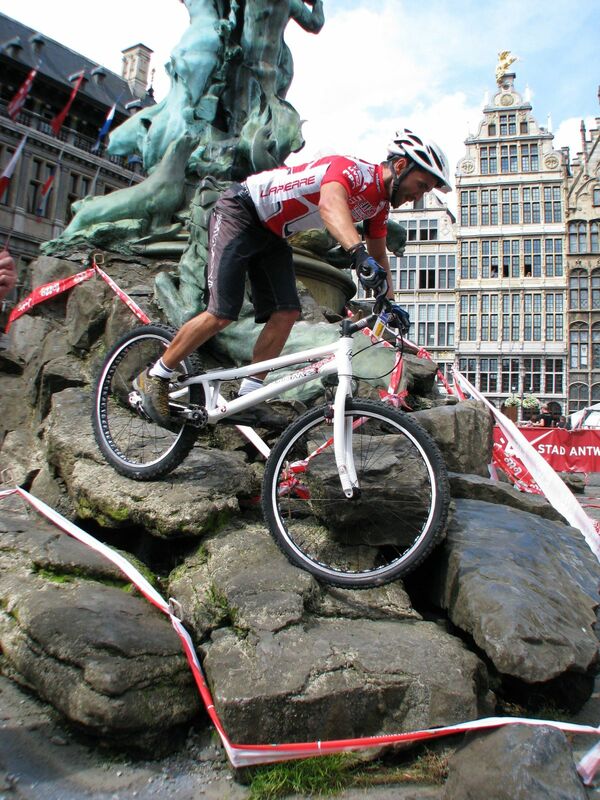 As the rear wheel rolls down, re-adjust your centre of gravity over the wheelbase of the bike. Avoid locking the brakes abruptly as this is likely to throw you over the handlebars. 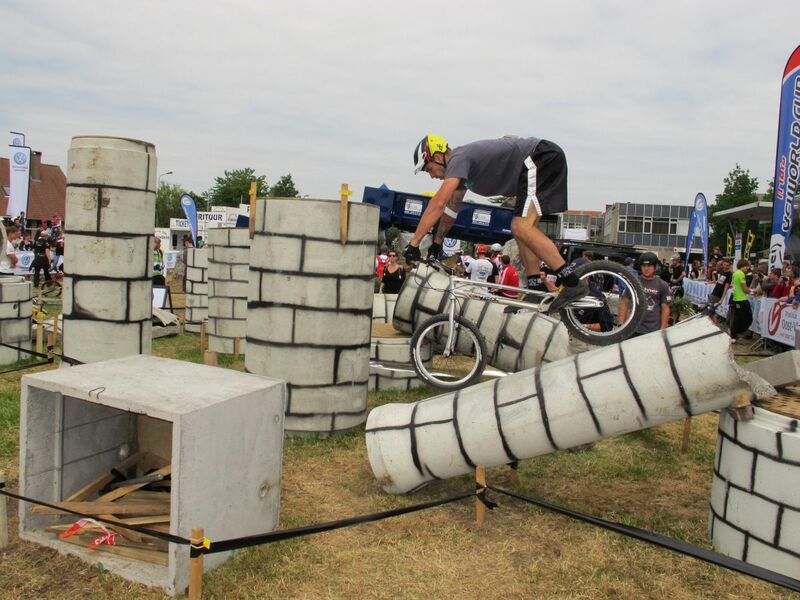 1° Ride to the edge of the obstacle until you get your front wheel right over the border. 2° Feather both brake levers, crouch back and stretch your arms to let the front wheel roll down. 3° Apply just enough pressure on the brakes to control the slow motion, keep your bum well over the rear tyre. 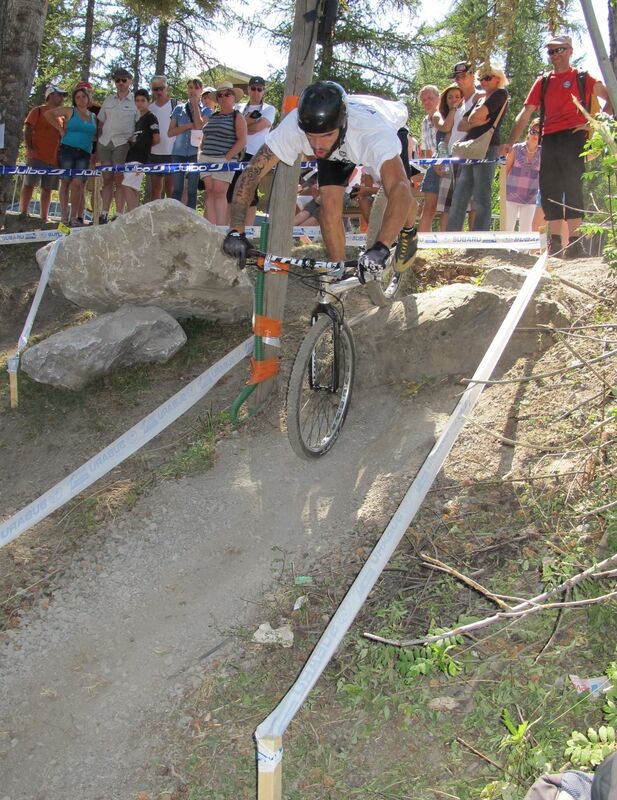 4° Stretch further, pushing the handlebars to the maximum until the front wheel touches the ground. 5° Once the front tyre is rolling on the ground, control the rear wheel descent relying more on the front brake. 6° As the rear wheel rolls down, re-adjust your centre of gravity over the wheelbase of the bike. Marc Caisso chooses his line for a smooth ride. Vincent Hermance rides down to the next exit. If the trail is very steep but wide enough, you can ride down at an angle that makes the path less steep, though you'll have less grip. Riding down can be quite tricky if there are some terrain irregularities because the front wheel can easily get stuck into a pothole and make you trip over the handlebars. Rolling down a steep slope in a rocky section requires a lot of precision as well as a good flair for choosing the right path. Only experience will make the difference between confidence and hesitation. Take long steep slopes at an angle. The bike will follow the front wheel neatly as long as you choose your line very carefully. If you see a recess or a bump that could block the front wheel, release the front brake briefly (while controlling the rear brake) and extend your arms in one push-up to swiftly roll the front wheel over it then use the front brake again. Experiment until you know your marks, but this approach works fine even on vertical steps that are approximately the height of a wheel size.